Have any traditional genealogy software programs that people use for recording their genealogy research added any features to support DNA research? I know there are a lot of DNA utility programs out there, but I'm more interested in features that have been added to what could be your main genealogy software for recording your information. This will include desktop programs and online family tree programs. Examples of some features might be the ability to record DNA data for any individual, provide autosomal percentages between people, indicate Y-DNA or mt-DNA candidates for your ancestors, or anything else that might be of use. Start Legacy and open the Individual's Information screen for the person of interest. Click on the DNA button. In the Available Tests section, highlight the desired test and click on the Add button. Record the results in the table. 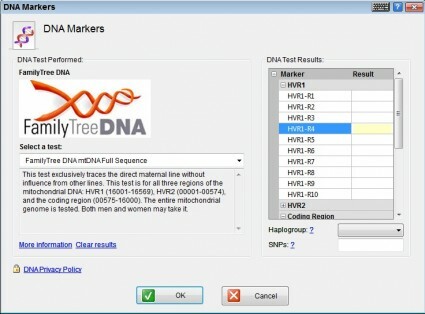 The RootsMagic blog says RootsMagic (Version 4+) allows to enter Haplogroup, testing company, testing lab, test kit number,... for Y-DNA and mt-DNA. 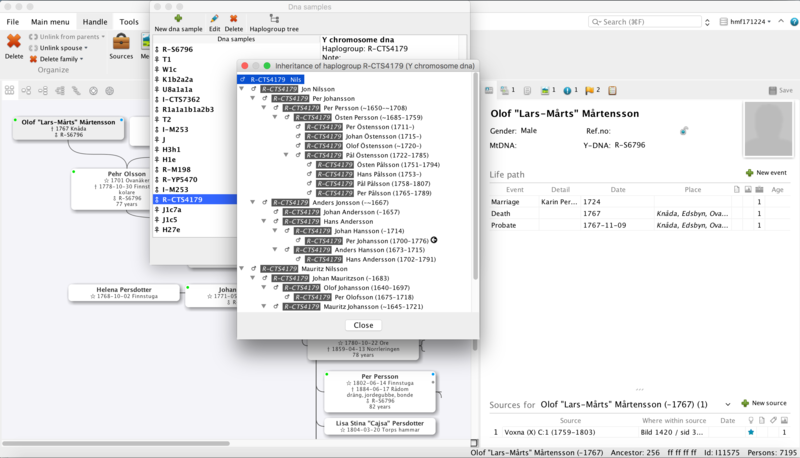 In the Swedish genealogy software Genney, you can add dna samples and haplogroups for Y-DNA and mtDNA. If you add a haplogroup to a person it will forward to all who inherit the haplogroup. It also has a conflict management system that manages conflicts between haplogroups. 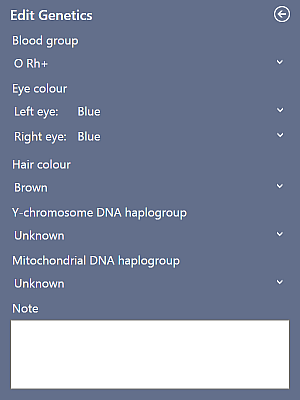 Haplogroup information is available in person boxes as text and with a green dot for Y-DNA and a pink for mtDNA. Genney can be used with English interface but the website is currently only in Swedish. Genney can be used on both Windows, Mac OS and Linux. The third party tool Second Site can display TMG's DNA data in chart form for comparison (Very good chart). RootsMagic states that "DNA tests will be imported from TMG, but the actual markers are not mapped to the markers in RM. The markers will be imported into the note for the DNA test"
Family Tree Builder (from MyHeritage) allow you to enter DNA Markers. 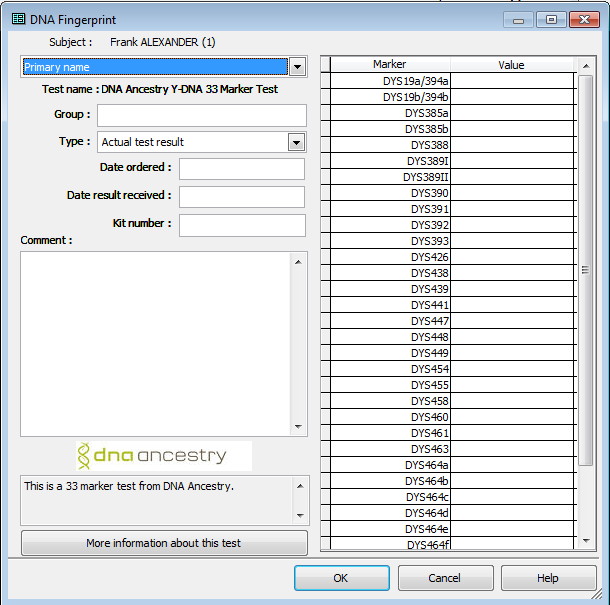 DNA Markers: There’s a comprehensive and encrypted new area for entering results from genealogy DNA tests. Family Tree Maker supports adding DNA info. If you do not already have your DNA information, you can order a simple test (such as from DNA Ancestry at http://dna.ancestry.com). Add the DNA fact to your list of facts in the Person tab on the People workspace by clicking the Add fact button , choosing the DNA fact, and then clicking OK. Enter the date your DNA was tested in the DNA date field in the right panel. 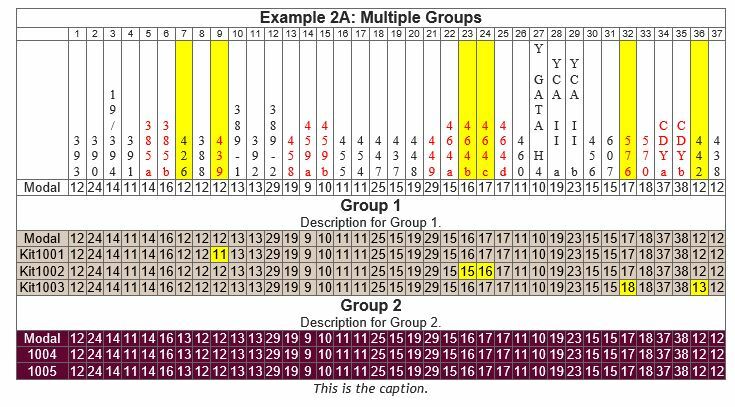 Enter the haplogroup in the DNA description field. Attach any other documentation (such as your DNA test results report) to the DNA media tab in the right panel. My Family Tree(Chronoplex Software) lets you store genetic information. You may want to take a look at the free program Genome Mate Pro. It is critical for my analysis of autosomal DNA match results from the three major testing companies in one place. Not the answer you're looking for? 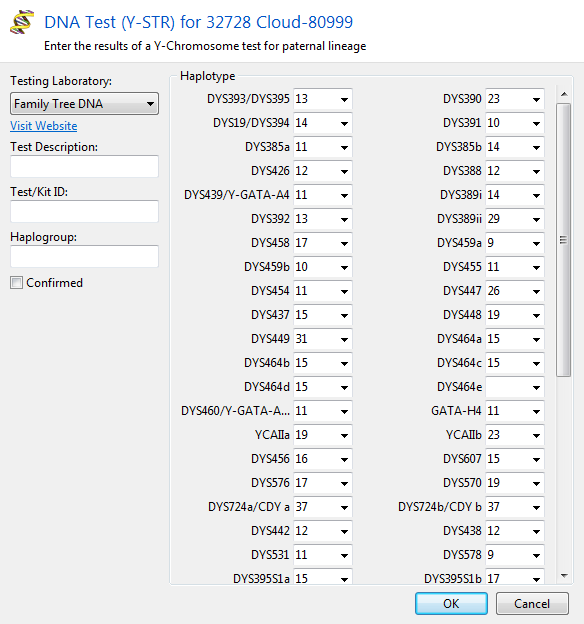 Browse other questions tagged dna software-recommendations or ask your own question. What DNA data is important to record? Intra Family marriage / rejoining family trees? 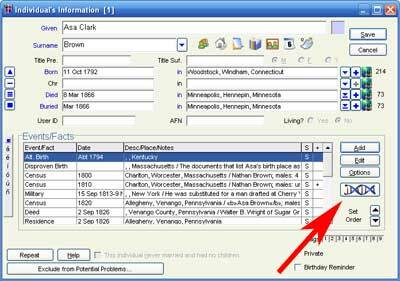 Genealogy software based on open database format? How does the GEDMatch Relationship Tree Projection Tool Work? Software/tool to generate 'trial' family trees?